On my annual fall grouse hunt in the eastern Upper Peninsula, a companion and I spent a few hours exploring instead of hunting. It paid off. Like others who are passionate about a pursuit, I'm often too single minded searcing for grouse in the fall and trout in the warmer months, and I miss looking at my surroundings. We were hunting near the Pictured Rocks National Lakeshore between Munsing and Grand Marais, along the Lake Superior shoreline. We tried an old hunting ground near Melstrand, but found it was no longer productive, so as we drove along, we decided to check out Little Beaver Lake. It was a real find. There are about eight campsites, all with a view of the lake. They are set up for tent camping, so don't even try getting an RV of any kind on the sites. Each has a fire pit, a soft sandy place to set up a tent, a picnic table and a lantern hook. There are outhouses nearby and water. The National Park Service deserve credit here for its thoughtful planning. Little Beaver Lake is connected to the larger Beaver Lake. Anglers and paddlers could spend a week camped there and paddling the lake. 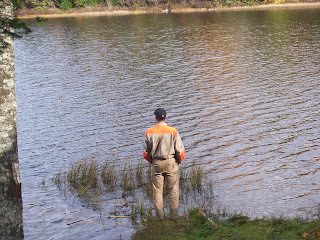 There are panfish, pike and trout in the lake. There's a small boat launch. I'm currently working on a new guide book for The Countryman Press, A Paddler's Guide to Michigan, due out in the spring of 2011, and plan on including the site in the book.